Martin Luther King Jr. was a great man and to be honest that sentiment doesn’t do justice for him. He did more than his fair share to make sure we live in a world full of equality. Every year this federal holiday comes around, but I think that most forget that it’s not just another day off. It’s a day to remember a man who took a huge stand for all of mankind. Not only did he help African Americans succeed and integrate into all facets of American society, but he reminded all of us that we all bleed the same and breathe the same way. That we are all created equal. His dream that we would all recognize it comes closer and closer every year. And that’s what we are truly celebrating on our Monday off this year. What better way to honor a great man and a great premise than to have it on our nails for everyone to see. Representing someone so brave and genuine with our nail art is one of the best things I can think of doing for a nail artist. So this post is for the nail artists in all of us and the dreamers in all of us. Those who hope to achieve and make things better just like Martin Luther King Jr. did. I’m starting off with this nail design that is very simple. It’s a dream script nail art. This is simple, elegant, but stand for everything Martin Luther King Jr. stood for. This nail art is inspired by his famous speech “I have a Dream”. This is part of the dream speech. I think it’s only appropriate to quote this a bit before we move onto the design and tutorial. Now, without further ado, this is the tutorial you will want to watch for your dream nails go here. This design plays off of Martin Luther King Jr.’s name. Using crowns in the design for his last name King. Which he was truly a King so it’s only fitting that we incorporate crowns in the design. There are also gems in this design only appropriate for royalty of course. Go here to check out this awesome tutorial perfect for Martin Luther King Jr. Day. 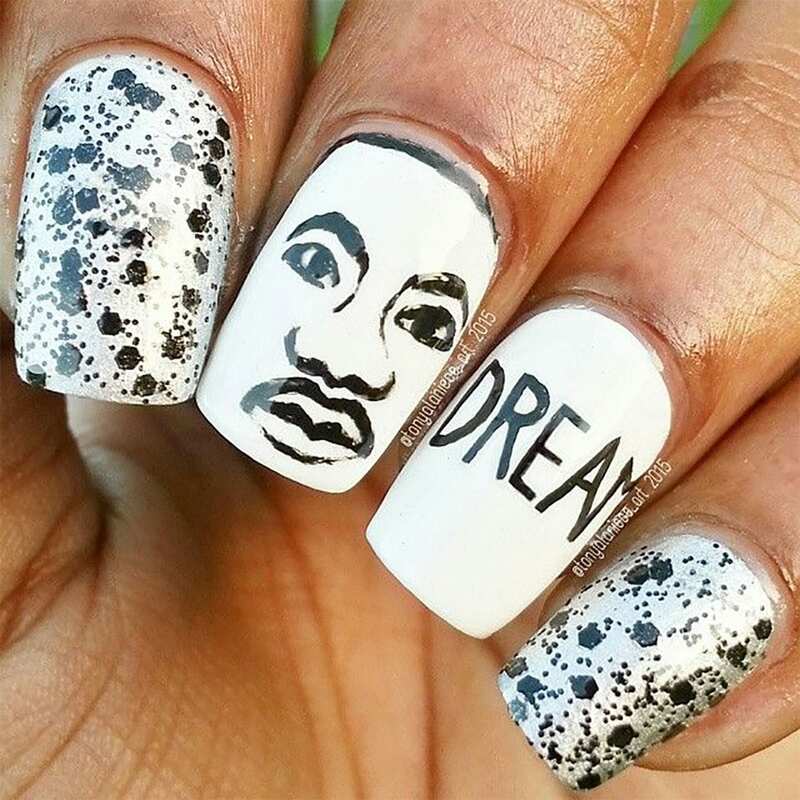 If you want to actually make some nail art that looks like Martin Luther King Jr. himself, you will want to check out this amazing tutorial. This nail artist really put a lot of work and effort into making this design honorable and detailed to look like the man with a dream himself. Check out the tutorial here. While this next design is considered a black history month nail art tutorial by the nail artist herself it does incorporate Martin Luther King in the middle alongside a black power fist and Afro positive symbols. There is even a reference to the Harlem Renaissance. You have to check out this tutorial that honors everything Martin Luther King Jr. stood for. So check it out here. Check out this awesome design that represents not only Martin Luther King Jr. but also his dream in a classy and elegant way. This design would be gorgeous on natural nails or acrylic. To check out this beautiful design and mimic it go here. 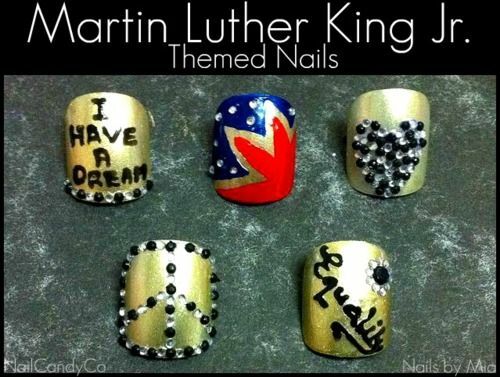 Another design you should try to mimic for Martin Luther King Day is this fabulous one. The artist not only uses Martin Luther King Jr.’s face in the design but quite a few other designs that are helpful in representing his message of love and equality. Dream on with these dreamy nails, check out the design here. This is what I call the equality nail art design. It represents Dr. Martin Luther King Jr.’s ideas and “dreams” for a better world. Gems in the shape of peace signs and other symbols are incorporated into this design for a full and peaceful look. If you support diversity, equality, and above all peace then this is the nail design you should be wearing on Martin Luther King day 2019! Go here and check out how they made this design. It’s blingy and perfect in every way. This design is another Black History Month design, but it incorporates Martin Luther King Jr. as well. So you can have it for this month and for Black History Month. This design incorporates a lot of trendy colors from this year and has a lot of great Afro positive designs that I adore. Check out this design here. Let us honor today and make it special with our artistic side.